90% & 40% US Silver Coins. 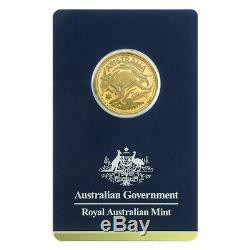 2018 1/4 oz Gold Kangaroo Coin Royal Australian Mint Veriscan. 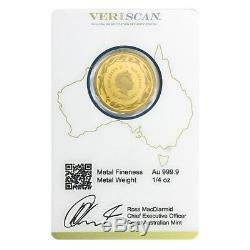 Bullion Exchanges is delighted to offer an amazing opportunity to own the 2018 1/4 oz Gold Kangaroo Coin Royal Australian Mint Veriscan, the latest release from Royal Australian Mint. 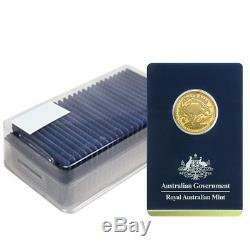 The coin comes in an attractive CertiPAMP packing with an assay card. 9999 pure gold with a weight 1/4 troy oz. Comes in new condition sealed in an assay card. Obverse: Displays a profile portrait of Queen Elizabeth II by Ian Rank-Broadley surrounded by the inscriptions "25 Dollars, " "Elizabeth II, " and Australia. The coin is bordered by branches of Tasmanian Blue Gum along with its flowers and nuts. Reverse: Features a beautiful image of a leaping kangaroo with Commonwealth star surrounded by Tasmanian Blue Gum leaves, flowers, and nuts. Inscriptions: "Australia, " date; content, weight, and purity. Bullion Exchanges offers you a great selection of exclusive items from renowned international refineries. 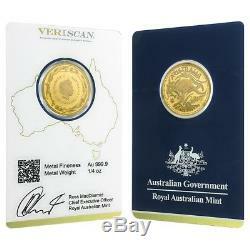 Add this splendid 2018 1/4 oz Gold Kangaroo Coin Royal Australian Mint Veriscan to your collection today, and it will be carefully wrapped, packaged, and delivered to your address. By purchasing from Bullion Exchanges, you are agreeing to all of our Terms and Policies. Bullion Exchanges reserves the right to refuse or cancel any order reviewed by our Compliance Team, which are deemed questionable or have increasing potential risk for being fraudulent. All customers are subject to a review at our own discretion, in which additional information, identification and/or documentation, may be requested. A prompt response would help expedite the fulfillment of your order. Packages are no longer insured if the tracking information shows the package is delivered. We will only be liable to cover packages that are lost in transit or damaged. There are no exceptions to this policy. Once an order is placed, it cannot be modified or cancelled. Using high definition digital video, we record the packing of our products to affirm accuracy. Bullion Exchanges reserves the right to refuse or cancel any order reviewed by our Compliance Team, which are deemed questionable or have potential risk for being fraudulent. The condition assigned to the products is derived from industry-wide standards. Please keep in mind that most images are stock images, and therefore you should not expect to receive the pictured products. Silver products, and some gold as well, may exhibit milk spots, and/or toning, which are normal and do not change the condition described in the listing, nor the value of the product. Coins that are holdered by one of the major grading companies are graded based on the condition they were in at the time of grading. We do not offer or make price adjustments based on the market fluctuations of precious metals, or for any other reason. We will never ask the customer to pay more for a product if the price significantly increased, so please refrain from requesting price adjustments after market prices decrease. The item "2018 1/4 oz Gold Kangaroo Coin Royal Australian Mint Veriscan. 9999 Fine In" is in sale since Monday, February 26, 2018.